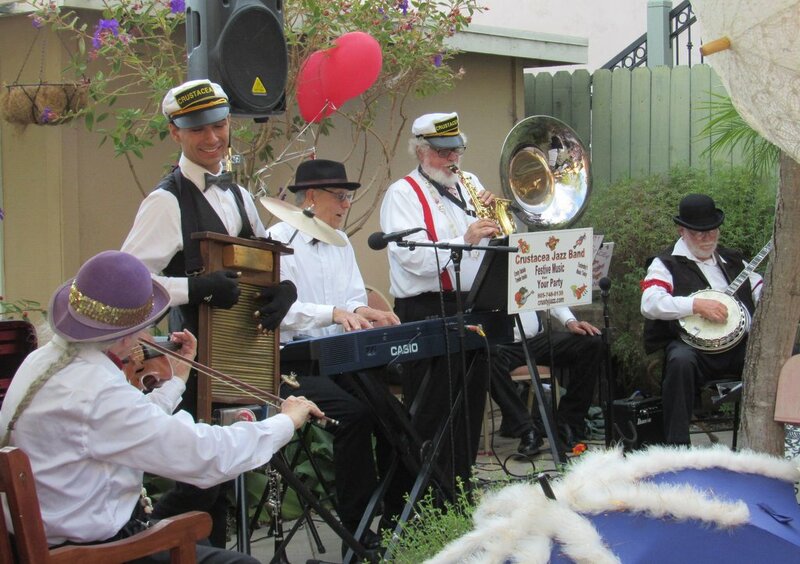 Crustacea Jazz Band plays danceable and swinging tunes in the New Orleans jazz style, tunes which were popular between about 1900 and 1935 and whose melodies are often still familiar. SLO audiences like and respond to this music first because it is upbeat, happy, humorous and romantic; and second because the creative act is happening right in front of the audience: Right Here, Right NOW! In this “old fashioned” Jazz, the players improvise and develop variations around a familiar melody line and the unique variations can result in a fun time for the audience as well as for the players. Over a hundred years ago this “small band improvised jazz style” originated in New Orleans. Throughout the twentieth century this music worked its way up the rivers to Memphis, St. Louis, and Chicago, and was spread by great local players to New York, Los Angeles and San Francisco and to all the towns in between. 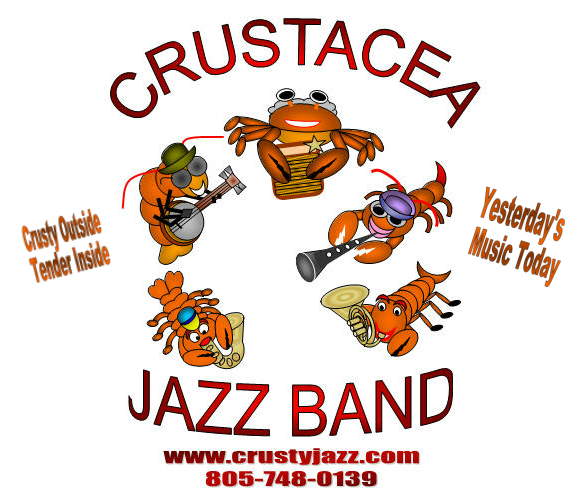 Crustacea’s repertoire showcases this original music, this music of America, as well as rags and gospel music, blues, and early pop tunes--all played in the New Orleans jazz style. There are bands playing this legacy of music all over the United States, as well as in England, Holland, France, Japan and elsewhere. Here are more pictures of the band. Here is our current playlist. Here are a few recordings of the band. Listen by clicking on the title. We are essentially a local jazz band playing the early music of America. Since 2009 we have performed at over 300 celebrations, parties, benefits, and weddings. Our public performances for farmers’ markets and festivals always draw an appreciative and enthusiastic crowd. We invite you to check us out at the any of the public performances that are listed on this website. As our band has become known we have played birthday parties (among others, the 50th, 80th, 90th, 99th, and in July 2016 we played a 100th birthday party), anniversaries (several 50th, one 70th), ten wedding parties, and several winery shows and benefits. We are a familiar band to the residents at Casa de Flores and Bayside Care Center and at The Villages and at The Manse. Since 2011 we've played the SLO Tweed Ride (fun folks with old-fashioned bicycles and dress--look them up!). We have played multiple times for both the Strawberry Festival and the Cayucos Senior's Luncheons. The Santa Maria Model A Ford Car Club hired us because we play the music that was popular in the era of the early automobiles. Our players all live in San Luis Obispo County. A great band for any celebration!